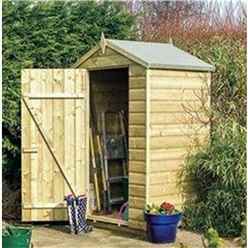 This product is an ideal shed for any outdoor space, especially smaller gardens. This Deluxe 4x3 Oxford Shed has a solid board floor and roof, and has a natural timber finish. The Deluxe Shed is pressure treated protecting it against rot, the roof is also covered in mineral roofing felt giving it an attractive appearance.